A Dollop Of Me | family, food, healthy living, life's tidbits: Geoduck! We were in Kuala Lumpur over the weekend (and the Monday) for a short break and to visit relatives. As with every trip there, I ATE SO MUCH! The local Malaysian fare is so incredibly delicious that I really tucked into huge meals. The rellies are all foodies, so they always know where we should make our eating pit-stops. I'll probably be posting some food pics over the next few posts, but these ones had to be the first. Doesn't it look absolutely disgusting?! I've probably eaten this before at wedding banquets, but I just never knew that it looked like this until recent years. 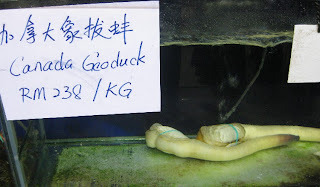 Geoduck is really a type of clam which is considered a delicacy in this part of the world. 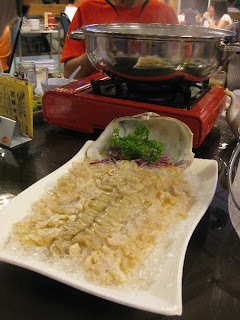 It is usually eaten hotpot style as you can see in the photo below or sashimi style with soy sauce and wasabi. It has a crunchy texture and it absorbs the flavours of the broth it is cooked in. I didn't want to eat it raw (although apparently it is a lot sweeter raw), after seeing the tank it was in, but quite enjoyed it cooked in the broth. In fact, I drank 3 bowls of the flavourful broth that was made with seafood stock and a variety of Chinese herbs. We collectively decided that we probably would not order this again though. Just this once to see how it tastes. me me! i like it fresh raw! Geoducks are wonderful. We used to go hunting geoducks (or as we called them, gooeyducks) on the beaches on Vancouver Island, and our Mom would cook them. They're wonderful in clam chowder too. They're easy to find, because as you walk over the sand, the geoducks squirt into the air from their little burrows. It's quite funny. imp: It is nicer raw! Sweeter!